The hottest topic in Ronald Reagan’s 1966 campaign for governor was the seemingly endless outpour of rallies, marches and protests at the University of California’s Berkeley campus, and on taking office in January 1967 after a landslide victory that left the state’s Democratic Party in shambles he moved swiftly to end them. 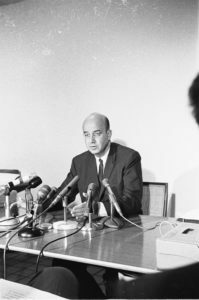 That month, at the first meeting of the UC Regents attended by Reagan, the board voted to fire university president Clark Kerr. The esteemed educator had led UC to new academic heights, but Reagan (and many other Californians) blamed him for campus unrest. Reagan thrust the governor’s office into areas traditionally left to university officials, such as monitoring student and faculty activities. He cut the university’s budget and pushed the regents to impose fees that were, in effect, the first tuition in the school’s history. Although some reductions surely were inevitable, he continued his campaign practice of making broad and unproven charges of academic misconduct, which damaged morale on campus, heightened public anger and undermined support for the institution. He even complained about “subsidizing intellectual curiosity.” But all this did not quell disorder at Berkeley or anywhere else. Hippies, black militants, and antiwar activists were challenging the establishment as never before. 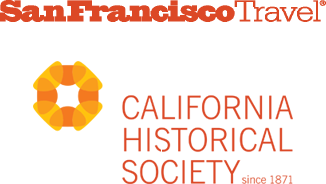 Nineteen sixty-seven was fast becoming the long hot summer, the Vietnam Summer, the Summer of Love. The week before Kerr was fired, tens of thousands people gathered for the Human Be-In at Golden Gate Park. Organized by Berkeley radicals such as Jerry Rubin, late of the anti-war Vietnam Day Committee (VDC), and Haight-Ashbury heavies such as Allen Cohen, editor of the Oracle underground newspaper, the “happening” on January 14 was intended to unite the parallel universes of antiwar activists and apolitical hippies in one cosmic force for peace and love. 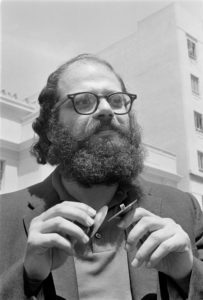 Allen Ginsberg, a VDC activist who with evident success had urged the Hell’s Angels not to attack one of the antiwar group’s marches from Berkeley to Oakland, donned a flowered garland to open the proceedings with a Buddhist chant. Timothy Leary exhorted the crowd to “Turn on, tune in, drop out.” The Dead and the Airplane played, the Hell’s Angels now provided security services, and the underground chemist Owsley Stanley III distributed free samples of LSD, only recently outlawed. 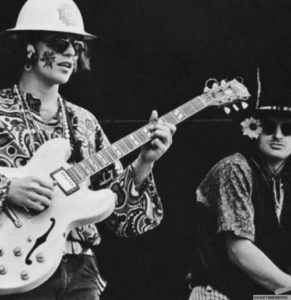 The event was, as they say, beautiful, and in its wake word of the new scene spread and tens of thousands of young people were soon converging on San Francisco and Berkeley for the Summer of Love. 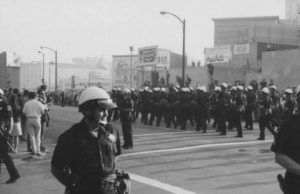 That May, Black Panther Party leader Bobby Seale and about thirty other young men and women wearing black leather blazers and berets and brandishing loaded guns strode into the California State Assembly chamber in Sacramento. Police promptly escorted them out, and as a crowd gathered Seale explained that they were protesting a bill by East Bay Assemblyman Don Mulford that would reverse existing law and prohibit carrying loaded firearms within Oakland city limits — a measure Seale declared was “aimed at keeping the black people disarmed and powerless at the very same time that racist agencies throughout the country are intensifying the terror, brutality, murder, and repression of black people.” Reagan dismissed their action as “absurd,” but in the following weeks the brazen visit attracted world-wide attention and hundreds of new members to the Oakland-based Panthers. Martin Luther King, Jr. still was the nation’s preeminent civil rights leader and was now emphasizing the use of political organizing and economic boycotts to overcome discrimination. (When he spoke from the steps of Sproul Hall at Berkeley that spring, he also urged students to organize a “Vietnam Summer” and build a peace block to end the “evil” war in Vietnam.) But though the militancy of the Panthers was endorsed by a minority of black Americans, it undeniably reflected a growing frustration with the slow pace of reform and fraying relations with police — tensions that ignited in “the long hot summer” of urban riots. The worst eruptions were in Newark and Detroit, while San Francisco had serious disorders and several other California cities had minor incidents. By year’s end there had been 160 disorders around the nation and at least $55 million in damage, 83 deaths, and many more injuries, mostly of blacks. The National Advisory Commission on Civil Disorders would conclude that pervasive discrimination in housing, employment, and education had fueled the conflicts. The demonstrations on Wednesday and Thursday were more civil, but on Friday, Berkeley students joined in the largest and most disruptive action of the week. Repaying the police for Tuesday’s abuse, protesters wearing helmets and carrying plywood shields jammed intersections by deflating car and truck tires or by erecting “barricades” of potted trees, newspaper racks, and garbage cans. Eight officers and ten demonstrators were injured. Extreme action begat extreme reaction. The clash, said Todd Gitlin, who joined in the protest and later discussed it in his book The Sixties: Years of Hope, Days of Rage, was a turning point from protest to resistance. Throughout it all, FBI agents, acting on orders from director J. Edgar Hoover, monitored every kind of dissent. As Congress later found, the bureau opened files on tens of thousands of law abiding citizens merely because they had voiced disagreement with government policy, and went beyond surveillance to mount unlawful COINTELPR0 operations to secretly stifle constitutional rights. By year’s end, California was leading the country toward an increasingly fractured state of the union, wracked by many of the same social and political forces that continue to roil the nation and the Golden State fifty years later. 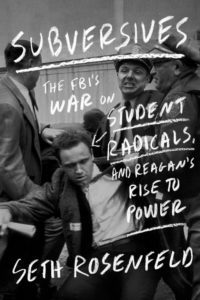 Seth Rosenfeld is a San Francisco-based journalist and author of Subversives: The FBI’s War on Student Radicals, and Reagan’s Rise to Power (Farrar, Straus and Giroux), winner of the 2013 PEN Center USA award for Research Nonfiction.